In a paper published in July in the SIAM/ASA Journal on Uncertainty Quantification ("Gauss von Mises Distribution for Improved Uncertainty Realism in Space Situational Awareness"), authors Horwood and Aubrey Poore, both of Numerica Corporation, propose a more statistically rigorous treatment of uncertainty in the near-Earth space environment than currently available. The method proposed uses a new class of multivariate probability density functions, called the Gauss von Mises (GVM) family of distributions. The uncertainty of a space object’s orbital state at different epochs computed from the prediction steps of the traditional extended Kalman filter (EKF), unscented Kalman filter (UKF), and Gauss von Mises (GVM) filter, and a particle filter. Shown are the respective level curves in the plane of the semimajor axis and mean longitude coordinates. 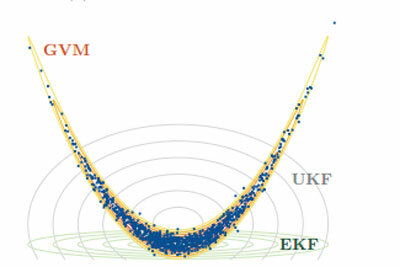 The GVM distribution correctly characterizes the uncertainty as depicted by the particle ensemble. Figure courtesy of Numerica Corporation. It is important to study uncertainty in the space surveillance tracking environment in order to protect space assets and maintain awareness of potentially adversarial space deployments. The proper characterization of uncertainty enables us to allocate resources in order to gain as much information about the system as possible, and detect satellite maneuvers. Better uncertainty quantification also helps us track and look for close approaches between any two space objects, a process called conjunction analysis. In order to quantify uncertainty, proper characterization of a space object’s full state probability density function (PDF) is required to faithfully represent the statistical errors. The GVM distribution approach is supported by a suite of next-generation algorithms for uncertainty propagation, data association, space catalog maintenance, and other space situational awareness functions. What distinguishes the GVM distribution is that it is defined on a cylindrical manifold, and such coordinates, used in conjunction with the GVM distribution, can provide a statistically rigorous treatment of uncertainty needed for orbit determination and tracking.